Candlewick Press (MA), 9780763646165, 32pp. A warmhearted story about a young girl who finds a way to bring together the two things that make her most happy- soccer and her family. Nothing makes Sierra happy like soccer. Her shoes have flames as she spins the ball down the spread-out sea of grass. But nothing makes her sad like soccer, too, because the restaurant where her auntie works is busy on game days and she can’t take time off to watch Sierra play. On game days, her auntie helps Sierra get ready and tells her, "Play hard and have fun." And Sierra does, but she can’t help wishing she had someone there to root for her by name, and not just by the number on her uniform. 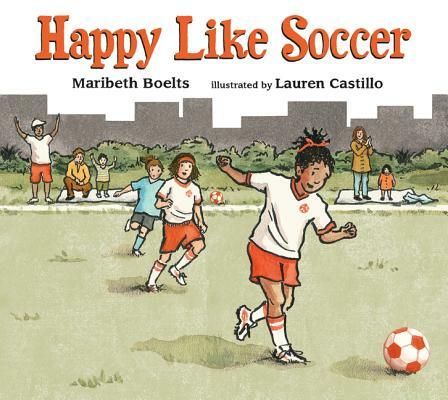 With honesty and rare subtlety, author Maribeth Boelts and illustrator Lauren Castillo portray an endearing character in a moving, uplifting story that touches on the divides children navigate every day- and remind us that everyone needs someone to cheer them on from the sidelines. Maribeth Boelts is the author of many books for children, including "Those Shoes," illustrated by Noah Z. Jones, which was a Charlotte Zolotow Award Highly Commended Title. About "Happy Like Soccer," she says, "Coaching soccer for a number of years, I saw the amazing impact a cheering family could have on a child-someone who knows and loves us and will root us on." Maribeth Boelts lives in Cedar Falls, Iowa. Lauren Castillo has illustrated many books for children. This is her first book with Candlewick Press. She lives in Brooklyn.